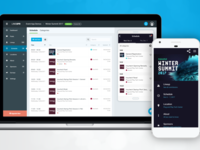 LineUpr is the fastest platform for creating mobile event apps for conferences, annual meetings, summits and more. 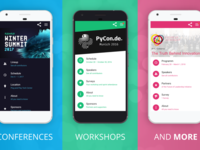 Create apps in only a few minutes and publish them instantly. No coding or design skills are needed. Communicate your agenda, speaker and sponsors. 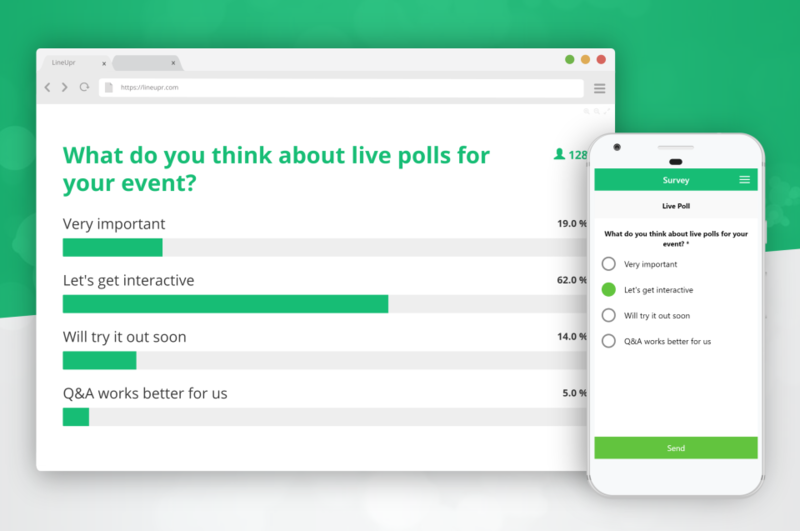 Use surveys to capture valuable event data and live polls to engage participants. LineUpr is the go-to-tool for more than 5.000 customers from large enterprises to local nonprofit associations. Visit our website to test LineUpr for free! 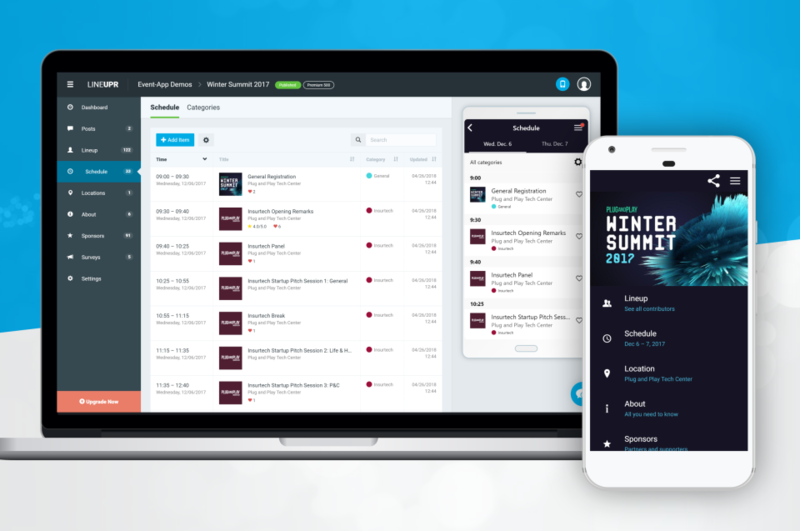 LineUpr is an app that equally makes the lives of event creators and visitors easier. Pros: LineUpr is very customer-friendly. The usability is great for both event creator and consumer as all of the features are self-explaining and the overall handling is easy, fast and intuitive. For the creator this is not only but to great parts due to the very helpful offer that you can transfer and adjust the settings and the content from one of your already existing projects to a new one. This can save you a lot of time p.e. if you're planning a series of similar events. In addition they offer an exceptionally good customer service so that in case of any problem you'll be looked after very efficiently and even in short notice. Cons: There isn't really anything we missed. The only thing one could criticize is that you can't really change the overall design of the app but in the end it does look simple, yet professional and you can choose individual colours to match your own corporate design. Overall: LineUpr is an application that offers many useful features such as the possibility to link artists/speakers to their item on the agenda and vice versa as well as the option to vary in the priority of items on the agenda so that important ones can be shown first regardless of the alphabetical or chronological order. The incorporated feedback feature for event-visitors and the real-time update function are also very practical. We've been working with LineUpr for a couple of years now and wouldn't hesitate to say that it always entirely met our needs. LineUpr is a great way to organise your event! Pros: It is very intuitive and easy to start working with LineUpr, so you can jump right in. The option to assign locations to the different items on the schedule is very helpful. That you can add these location to the integrated map makes the navigation for participants really easy and the option to post announcements to the front page is very handy for the organisers. Cons: With an extensive schedule and a large amount of additional content editing gets a bit confusing but that's criticism on a very high level. Overall: We were organising a four day conference at our university for about 650 participants. We mainly used LineUpr to communicate the schedule and locations. The main advantage versus classical paper schedules is that you can immediately update the schedule in case of any changes. The feedback from our participants for the app was amazing and we will definitely use it again next time! 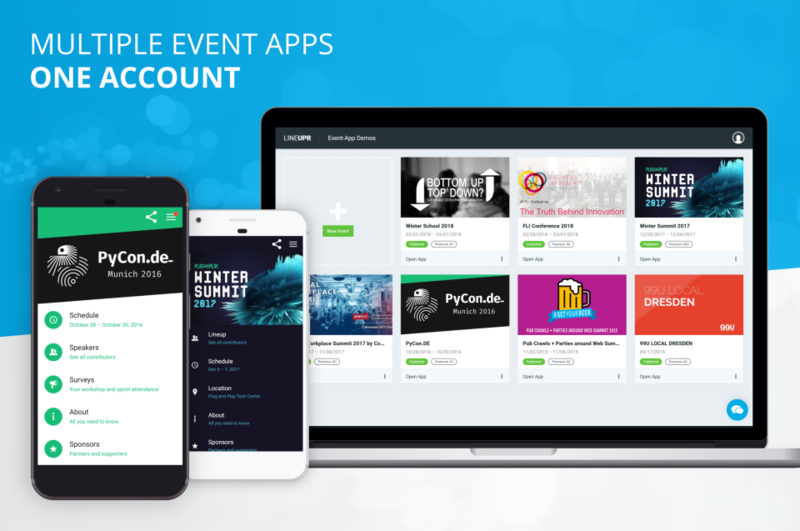 Pros: It is easy to maintain, we liked the design and it matched exactly our requirements for an event app. If you have any questions, the LineUpr Team is helping you immediately. Save your time, effort and money, and use an existing app, instead of developing it by your own. So it is an easy solution and an asset, which you need to have these days on conferences to be professional. Cons: We had some special adjustments, which were not possible. So, if you search some very unique features, check with the customer service first. Cons: Nothing really important. Small things which I already communicated to LineUpr. They got back to me within a very short time. TOP! 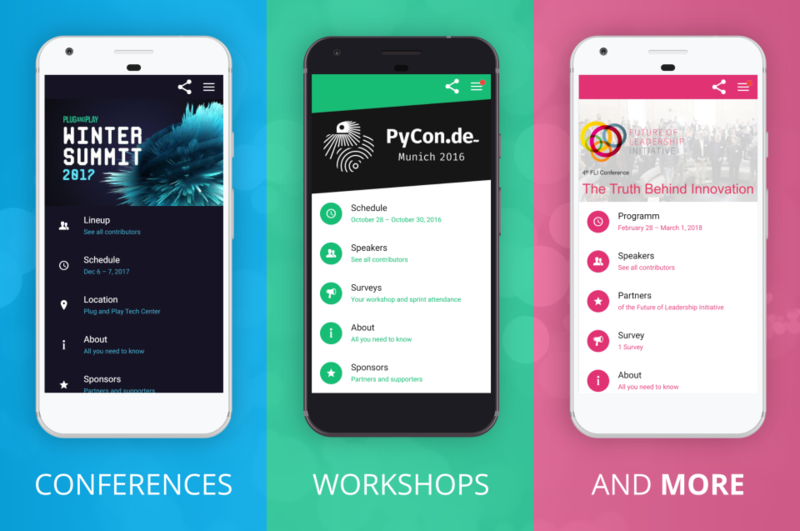 Overall: We used LineUpr to create a Event APP for a 200+ Barcamp in Leipzig, Germany. The members of the Barcamp could see the Sessions, Experts, Agenda and important Information on their mobile devices. Saved a lot of time. We got very good feedback from our visitors. Pros: The easy way to work with it. It is really simple and intuitive and makes the work of creating content fast and practical. The templates and pages that already exist, give us inspiration and a good guideline on how to use it in our event. I really enjoy the possibility of creating a schedule of the event with all details for each session: venue, topic, facilitator, etc. Cons: From the feedback we had from the participants, we just miss a feature to enable chat or conversations between participants. 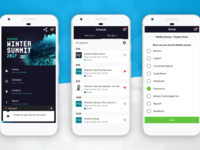 Another feature that can be improved is the results of surveys and feedback from each session, because only the creator of the content can see it. It would be good to have a way to export or present to other people, including the star rating on each session, feedback and general evaluation. Overall: The experience was wonderful, since the creation of content to how practical it is to use it during the event. I would use it again and again. Actually we are still using it even after the end of the event. Best new tool out there! Pros: Probably the best tool out there to facilitate communication during an event and give clients/ participants easy access to all the information they need. Super easy to handle, pretty and well Organized interface, in particular live time updates/ changes. We got only extremely positive feedback from our participants and will certainly use it again for every single event we'll organize from here on! Cons: There is honestly not a single thing that bothered us so far. Pros: It was extremely easy to set up the event . 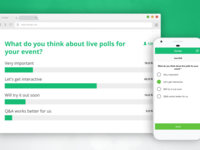 It is quite user-friendly and has many useful functionalities for event management such as providing location maps, sending out surveys and posts and letting the participants put bookmarks into the schedule. I liked that the changes made during the event came immediately into effect. I also like that it's simply a mobile friendly website and people do not have to download and install an app. Cons: There wasn't really anything I disliked. One functionality I would find useful to add is letting event participants register themselves as contributors/attendees. Overall: We used LineUpr for a barcamp event with 70+ people. LineUpr helped us visualize the session board online for everyone to easily access it on their mobile phone. The event had 4 different session lanes, so the bookmark feature came in quite handy. I would definitely consider using LineUpr again for an event. 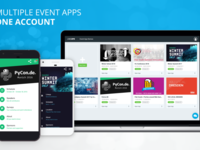 Great experience building an event app! Pros: Smart copying options, easy drag & drop functions and an intuitive setup made it easy and flexible to work with LineUpr. What is best is that the users do not have to install an app and that all the program data is available on the smartphone. Cons: One detail to improve: When you enter the starting date of a program item, the ending date should jump to the starting date and not remain on the default value. Eventbrite integration would be appreciated very much. Overall: The event app and the backend did not only keep what LineUpr promised, it worked even smoother and better! Our LineUpr event app allowed us to spread the word of 10th Hamburg Climate Week. It offered the visitors the possibility to discover our event program, customize their individual program and have all information in their pocket via smartphone. So the app helped to increase the number of visitors and to make them happier. Pros: The app was really easy to use. With the drag & drop it was almost self explaining, and with the mobile phone at the screen you can see ur changes right away. you can even use your own colors. It was the beste choise to use lineupr. But it is not just the app that we liked, it also the customer service. we recevied 2 or 3 mails, where they gave a couple of hints. Cons: While buuiling the event app, we had a little porblem to set up an extra menu. But after a quick call with the lineupr staff, it worked. Overall: We used the app for our anual chartiy event. our goal was to inform the attendes before the event - show the the schedule, who would be on stage, which prices the could win, let them interact with the stage guest and so on. Pros: One of the best things about this event-Software is, that it is so easy to come by and intuitive to work with. When adjusting the settings for your event (poetry-slam festival in our case) you almost always find what you are searching for in a few seconds. Being able to reach all attendees through their smartphones in an easy way is something you don´t want to miss again after trying it out. And last but not least: the support from the developers is friendly, fast and helpful - everything you might wish for. Theres just nothing I missed when we had our event with the Software. Pros: So many fantastic functions, yet super easy for our delegates to use. LineUpr is fast, includes lots of customisation options, and is cross-platform. Their customer service is world class! Cons: I genuinely can't think of any negatives. We used it for a week long residential conference and it was loved by organisers and delegates. 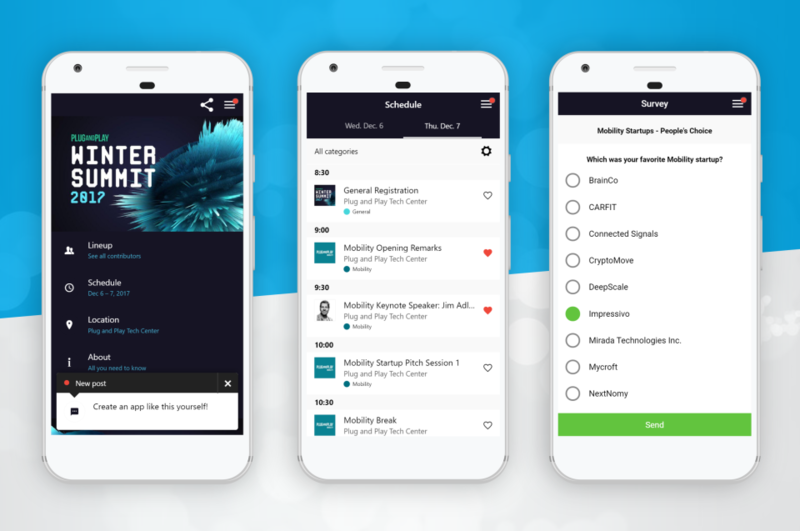 Overall: We needed a fast, powerful, events app for a week long conference in a venue with patchy wifi/signal. LineUpr delivered fantastically! Pros: Simply everything. The system is very easy to use and intuitive. It offers a high varity of features and settings. The resulting app looks really great and all users liked it. Cons: I had some small problems according to picture resolutions but I talked to the support already and they helped very well.